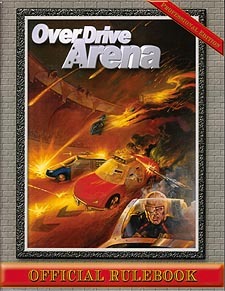 OverDrive Arena is a racing game set in the near future. Racers gather from all over the world to test their driving skills in these modern day gladiator competitions. Some racers are independent, loners trying to work their way up the racing circuits, hoping to make it to the big time arenas. Some racers are members of teams racing in high stakes competition, complete with corporate sponsorships and big budgets. There are even those that have achieved superstar status and race for only the best. All are seeking fame and fortune. In this game, there are different scenarios with different conditions and victory terms. Some require races to complete a certain number of laps; some require certain conditions to be met. Others require you to eliminate the competition. Whatever the conditions are, it is important to remember that if your vehicle is removed from the race, for any reason, you lose.